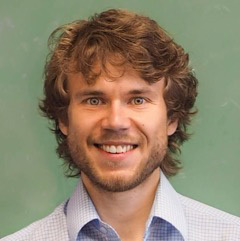 John Wilmes starts as an assistant professor in the Department of Mathematics in Fall 2018. Along with two other new faculty members, Jonathan Toubol and Thomas Fai, he will contribute to the new Applied Mathematics major. His research is in discrete mathematics and the theory of computing, particularly focusing on structure and symmetry in networks. John’s research is motivated by the analysis of algorithms on discrete structures and machine learning theory. Before joining Brandeis, John spent two years as a postdoctoral fellow and research scientist at the Georgia Institute of Technology, where he received the Outstanding Postdoctoral Research award from the College of Computing. He completed his PhD as an NSF Graduate Research Fellow at the University of Chicago under the supervision of László Babai. At Brandeis, John plans to continue studying the symmetries of discrete structures and developing rigorous analyses of machine learning algorithms. He is particularly interested in using insights from neuroscience as inspiration for new algorithms.